With a great sweet dough recipe, variations are endless. You can make raisin bread or cinnamon rolls or even hot cross buns. All home bakers should have at least one great sweet dough recipe in their repertoire. The Good Housekeeping Illustrated Cookbook is a good place to start. Bread is magic and every country has its own way of conjuring yeast and flour and water into nourishment that not only sustains life but also gives many a reason to continue living. (Thinking of my friend, Carol, here who would probably choose bread if she were only allowed to eat one thing for the rest of her life.) From the roti canai of Malaysia and the baguette of France to the pão de queijo of Brazil and the aish baladi of Egypt, we have taken bread to heart as we learn to love the places we have called home. Bread is comfort, from the therapeutic act of kneading the dough and the deep yeasty smell as it rises in a warm place, to the heady aroma while it bakes, drawing the family near. I guarantee, you’ll never have so many friends as when fresh bread comes out of your oven. This recipe is adapted from my old standby, Good Housekeeping Illustrated Cookbook, 1980 edition. 1 packet active dry yeast (1/4oz or 7g) I use Fleischmann’s Rapid Rise. Put your sugar, yeast, salt and half a cup of flour in the bowl of your stand mixer or other bowl if you are going to use hand beaters. Put the milk and butter in a microwaveable container and heat until it reaches between 120 and 130°F or 49-54 °C. If you don’t have a thermometer handy, this would feel quite hot to the touch (I mean, put a finger in it.) but you would be able to keep your finger in it comfortably. The butter doesn’t need to completely melt. Pour the warm milk mixture into the mixing bowl and beat until combined. Add in one banana and one egg. Beat well. Add one cup of flour and beat well. Add more flour, a half a cup at a time until you have a soft dough and it’s too stiff to beat in the mixer anymore. Use a wooden spoon or a sturdy spatula to mix in the last of the flour. Scrape the dough out of the bowl and onto a floured surface. Knead well for about five minutes. Wash your mixing bowl out and spray the inside with a little non-stick spray or rub with butter. Form a ball out of your dough and pop it back in the bowl to rest and rise. Ideally, you want it to double in size. This can take anywhere from half an hour to an hour, depending on your yeast. Cover with a cloth and if your room is colder than 80-85 °F or °C, put the stopper in your sink and fill it part way up with hot tap water. Set the bowl in the sink. While the dough is rising, grease your bread pan and make the filling. Melt the butter in a medium sized non-stick skillet and slice the two bananas into the pan. Throw in the pinch of salt. The butter will start to bubble up and the bananas will caramelize a little. They are done when the milk liquids have evaporated and only the oily part of the butter is left. Set it aside to cool. When your dough has risen sufficiently, punch it down. Spread it or roll it out into a rectangle (about 12x18in or 30x45cm) on top of a large sheet of cling film on a clean counter top. Distribute the bananas and butter evenly over the rectangle of dough. Sprinkle with the light brown sugar. As the dough is already sweet, I used about a 1/4 cup of sugar but if your family loves things sweet, feel free to use more. Sprinkle on the teaspoon of cinnamon. Start rolling the dough up on the short side until you have a neat tube. Fold the sides of the roll under. Place the dough seam side down in your greased bread pan. Sprinkle with a little flour and, use a sharp knife or lame´ to cut some slits in the top of the dough. Set in a warm place - this could be the kitchen sink with hot water again, if necessary - and allow to rise until doubled. When it’s getting close, preheat your oven to 350°F or 180°C. Almost flowing over the sides of the pan! Bake for about 35-40 minutes or until the crust is a nice golden brown and the loaf sounds hollow when thumped. Turn it out on a wire rack to cool a little before cutting. This stuff is great just as it is but it is even better when slathered with some butter. For breakfast the next day, assuming there is any left, toast it and apply butter liberally. Delicious! I make banana bread..well, a lot, but I've never made it with a yeasty dough. 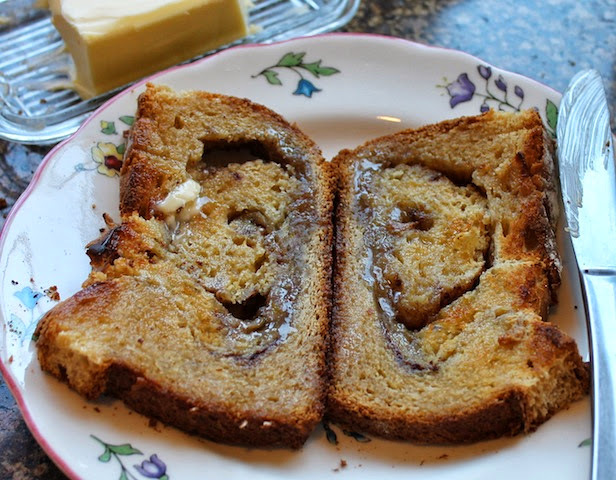 This looks like the perfect base for a banana bread french toast! I hear sunday morning brunch calling me! It's not your typical banana bread that rises with baking powder, Toby. I struggled over what to call it to convey that. It would make fabulous French toast. I can't tell you how good it was toasted! I kind of love that this is a yeast bread and not just a quickbread! So good! I'm in the club as never having made banana bread with a yeast dough. Fascinating! The problem I've discovered with traditional banana breads in my family is that everyone likes them fresh out of the oven but, if it's not all eaten, I can't give it away the second day. Not a problem with this one! It's just as good, if not better, toasted. It was an experiment that worked out, Dorothy! Lord, Stacy! I can't even think of anything else to say. You are so right! Don't know why that didn't occur to me, Jenni. I made a Bananas Foster muffin last year so I should have thought of that! Good, because it totally is. A compliment! Dang! I love this and so will Jerry - all bananas and no nuts! Yeah, a person always could add nuts or even raisins but we liked it like this. Those caramelized bananas look heavenly!